This Thursday is Dumbo's monthly First Thursday art walk, and we're putting together a joint show of photography final projects from BKC's Digital Photo I and Digital Photo II classes. Come to Dumbo and see some exhibitions from neighboring galleries, and join us for drinks and refreshments as we showcase the work of students and enjoy a warm summer night. Featuring work by Matt Anderson, Paula Berkenstadt, Marc Brawer, Javier Fagundez, Andrey Gabisov, Aijah Keith, Doan Ly, Maeve Nicholson, Merci Oni, Lee Press, Michael Savage and Chaya Sebbag. 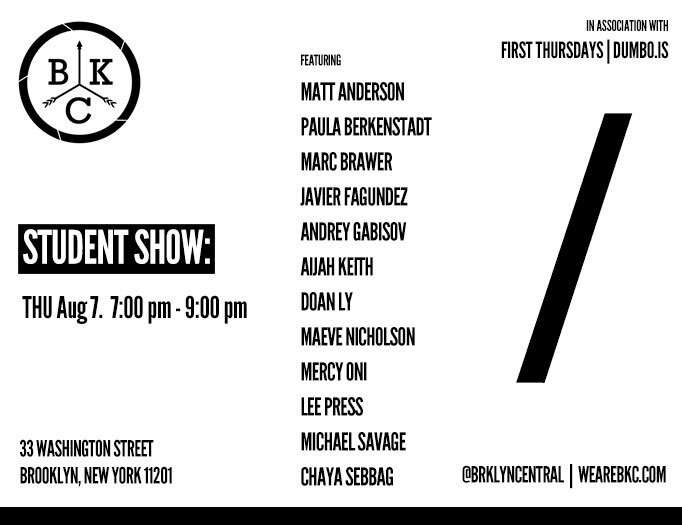 Join us here at our place, 33 Washington Street, in Dumbo this Thursday August 7, 2014, starting at 7:00 pm.